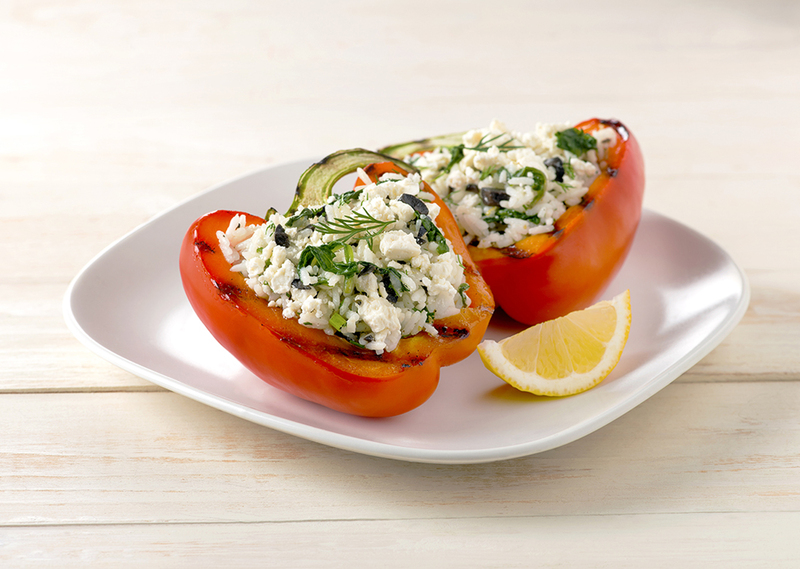 This fresh take on Greek-style stuffed peppers uses instant rice making it a breeze to whip up. Grilled Stuffed Peppers: Preheat George Foreman Grill for 5 minutes with lid closed. Brush peppers with oil and season with salt and pepper. Place on grill, cook, turning occasionally, for 8 to 10 minutes or until charred and tender. Rice Filling: Stir oil with lemon juice, lemon zest, garlic, oregano and salt and pepper. Stir in dill and green onions. Meanwhile cook instant rice according to package directions. While rice is still hot, stir in spinach, dressing and olives. Let stand, covered, for 1 minute or until spinach is wilted. Stir in 1/4 cup feta. Spoon into pepper halves. Sprinkle with remaining feta. Garnish with dill sprigs and serve with lemon wedges, if desired. Tip: Use brown rice for a boost of fiber.